Soufflé, if I Blow, Will it Fall? — Le soufflé, si je souffle, il va tomber ? You do not even need to do anything. It happens on its own. They fall indeed, whether you blow or not. What a short life soufflés have! They are only reaching a high point proudly for a few ephemeral seconds, not even taking the time to enjoy the climb before they go down again, without giving any warning sign. 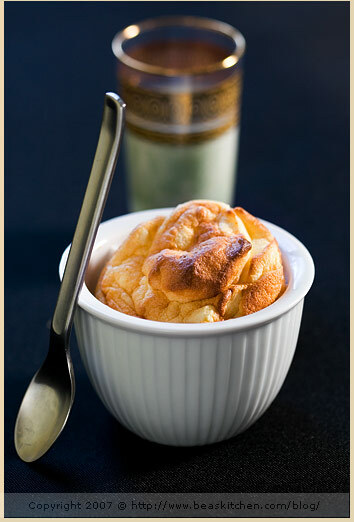 Le soufflé is definitely one of the most challenging dishes that I have had to shoot. As the photographer, you literally have less than thirty seconds to take the photo if you really want to render justice to how beautifully tall a soufflé rises when it reaches its peak. Yet, as soon as the door of the oven opens and Sir Soufflé gets out to get some fresher air, the fun is over. Falling steadily down until it collapses. Tamy who is hosting the Donnay Hay Event this month knew about this well when she chose the monthly challenge to precisely be making and shooting Soufflés. Tough! Pas facile ! 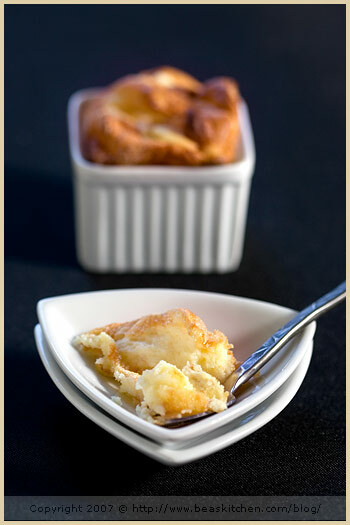 Soufflés can be sweet or savory, served cold or warm. In any case, they both consist of a thick cream made of eggs, milk and flour (or cornstarch) that will be flavored with various ingredients, vegetables, fish, meat for example if they are savory, and chocolate, vanilla, and many other flavors if they are sweet. Egg whites beaten en neige ferme (firm) are added to the cream to lighten it and create the airiness of a soufflé. This sounds easy enough, doesn’t it? Believe me when I tell you that soufflés are really easy to make. In fact, I liked Tamy’s idea so much that instead of making only one soufflé, I tried my hand at making two, one sweet and one savory. They might have teased me when I tried to take photos, but I had my revenge. I enjoy eating them that much. To make a savory soufflé, you need to have an idea on how to make a béchamel, which is a French classic sauce. This thick white sauce consists of milk, flour — or cornstarch — and butter mixed together, to which eggs and often cheese are added. For my savory recipe, I decided to add saffron and crab. I right away loved the nice bright yellow color color it gave the soufflé. I then added a fruity cheese, Tête de Moine (literally meaning Monk’s Head), but should you have any trouble finding this cheese, I would advise choosing a fruity cheese generally speaking, such as Beaufort, Comté or any flavorful cheddar. For my sweet soufflé, I stayed traditional and chose vanilla as the main flavor. The idea of the soufflé staying the same, I first made a thick sweet cream similar to a custard that was lightened by egg whites beaten firm. So what is the trick with soufflés then? Why so many people are scared of them? Because they fall? Well, two things to keep in mind. No matter how careful you are, even if you are good enough to NOT open the oven door before the cooking time is over, they will come down anyhow, deflated. This is what soufflés are all about, after all — unless I am missing some trick, which I would love to hear about if anyone knows about it. Then, no matter how deflated they are, they are tasty and I personally never get tired of them. When I was a kid, whenever my mum was making a soufflé, it felt like a truly special day, like a sunny Sunday. 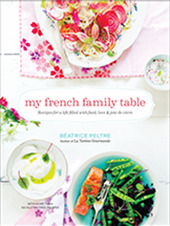 Yes, she really made us *happy* when she used to bring even the simplest soufflé on the table. Many years later, the feeling has not changed. To make your white sauce, dissolve the cornstarch in a little bit of water, then pour in a pot. Add the cream and milk with the saffron, and bring to a gentle boil, without ceasing to stir. The preparation will thicken. Away from the heat, add the butter, season with salt and pepper. Mix well. Add the egg yolks, one after the other, mixing well for each. Whip your egg whites firm with a pinch of salt. Add a spoonful to the egg preparation and stir. Then add the cheese and crab et mix. Fold in carefully the rest of the egg whites, and make sure it stays light. Grease 4 small soufflé molds and fill them 3/4 full. Place in the oven and cook for 5 to 8 min, then reduce the heat to 350 F and continue to cook for about 15 to 20 min, until they reach a nice golden color (35 to 40 min for a large soufflé dish). Preheat your oven at 350 F.
Heat the milk on low heat with the vanilla bean cut in halves, and seeds added. With a hand mixer, beat the egg with the sugar until white. Add the cornstarch and mix. Add the milk and mix well. Pour this cream in the pot again and cook on low to medium heat until it becomes thicker. Remove and let cool down slightly. Beat the egg whites with a pinch of salt and cream of tartar (optional), until firm. Fold it carefully in the vanilla cream. Grease four ramekins, sprinkle with sugar and fill them 3/4 full. Cook in the oven for about 30 min or so, until they are puffed and golden. Serve immediately. Pour faire la béchamel, délayez la maïzena dans un peu d’eau et versez-la dans une casserole. Ajoutez le lait et la crème et faites épaissir sur feu doux avec le safran, sans cesser de remuer. Hors du feu, ajoutez le beurre, salez et poivrez. Ajoutez les jaunes d’oeuf un à un, sans cesser de remuer. Montez les blancs en neige ferme avec une pincée de sel et la crème de tartare. Ajoutez une cuiller au mélange précédent pour le détendre. Ajoutez le fromage et le crabe, mélangez delicatement. Ajoutez le reste de blancs en neige et soulevez bien la masse. Beurrez 4 petits moules à soufflé et remplissez-les aux 3/4. Mettez au four et cuisez pendant 5 à 8 min, puis baissez la température à 180 C. Cuisez pendant 15 à 20 min environ (pour des petits soufflés), 35 à 40 min pour un grand. Préchauffez votre four à 180 C.
Faites chauffer le lait dans une casserole avec la vanille fendue et grattée. Battez l’oeuf entier avec le sucre à l’aide d’un batteur électrique. Ajoutez ensuite le lait chaud et mélangez bien. Remettez cette crème dans la casserole et faites épaissir à feu doux à moyen. Une fois épaisse, transférez-la dans un saladier et laissez-la refroidir un peu. Montez les blancs en neige ferme, avec une pincée de sel et de crème de tartare (facultatif). Mélangez-les délicatement à la crème à la vanille, en prêtant attention à ne pas casser les blancs. Graissez quatre petits ramequins et saupoudrez-les de sucre. Remplissez-les aux 3/4 . Cuisez au four pendant 30 mns environ, jusqu’à ce que les soufflés aient une belle couleur dorée. Dégustez sans attendre. Bea, tes souffles sont magnifiques!!! ca me donne des idees de cuisine pour ce week end. Cette page est elle aussi superbe. Je crois que je vais faire un ptit tour sur ton blog. wow, you never ever disappoint Bea. I can just smell the sweet aroma of vanilla and saffron wafting through the air. Tes soufflés sont très réussis. J’ai reçu du safran véritable de la part de Framboiz. Le marier au crabe est une délicieuse idée! Such sweet little souffles! They look absolutely wonderful. I made one of these not so long ago and the aluminum foil I had wrapped around my dish to support the sides gave way and the whole thing oozed/exploded all over my oven. I nearly cried. Béa…I’ve just been catching up on your recent posts and I have to say that it just occured to me that I get more pure pleasure from your blog that any 10 others I look at combined. The photos, the food, the whole atmosphere is so nice! Keep it up….! I love your informative post! Bea, the idea of crab and saffron is excellent! Like you, I don’t care it falls, still love eating it! only Bea could make a collapsed soufffle appear so enticing! Can I come to your house and be a taster? Can I come to your house and be an assitant? I think it would be interesting to film the fall of the souffle and put it on you tube!! Certes pas simple à photographier mais tu t’en sors comme un chef ! Béa, each time, I came to visit your blog, I was impatient. 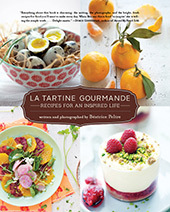 For the photo, sure…for the recipe, certainly, definetely for your talent. Terrific and elegant. Beautiful souffles Bea! I can only hope that one day I can take pictures even half as good as yours! such cute little souffles, very lovely shots. They are proud little things, not terribly fallen and mishaped, great images! I tried to make both sweet and savoury souffles as well. Mine did not turn out nearly as beautiful as yours, and I doubt they were as tasty either, my souffle skills are subpar. Just beautiful! Souffles are wonderful even as they fall, as you say that is what they are about and they are still most excellent on the tongue! Bea, quick question: if you add the eggs to the cream and milk, are there additional egg whites to whip? Sorry for the stupid question, but I’ve nver made souffles before. souffle is in the air! 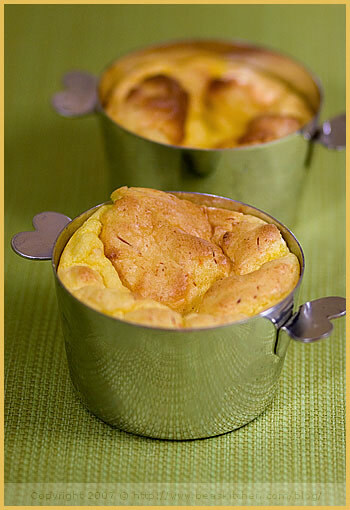 just been to 80breakfast’s site and it’s also about souffle…when when will i get my turn? love your triangle saucers bea! have a great weekend! Dis-moi Béa, où as-tu acheté les moules en inox avec les poignées en forme de coeur ? Ca fait des lustres que j’en cherche !!! hmmn, I’ll take a note and mix crab and saffron together next time . It sounds and looks really good! Magnifique et pourtant ce n’est pas facile de réaliser de belles photos de soufflés ! Et une fois n’est pas coutume, ma préférence va cette fois à tes petits soufflés sucrés, leur légèreté me fait saliver et j’imagine très bien leur petit goût de vanille…Parfait pour terminer en beauté un beau repas de fête ! Et bien, c’est juste la paradis là….juste parfais et divin….woaw !!!! S’il y a bien un plat que je suis toujours impressionnée de voir (gonflé) en photo, c’est celui-ci ! Et je ne m’y suis jamais risquée, j’ai trop peur de l’effrayer avec mon objectif, et que ppppfffouuuuuuuuuuuu ! I love the ingredients you chose for your savoury souffle – I’ve never heard of crab souffle before! Vanilla is always a winner. Quelle jolie déclinaison ! Personnellement, je les apprécie autant salés que sucrés! Souffles look beautiful even after they fall! That’s a great recipe…crab and saffron are gorgeous together. 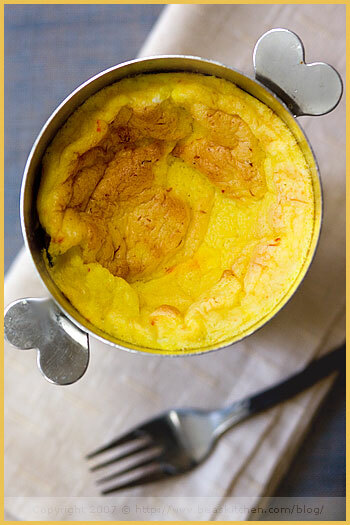 I love the gorgeous hue of the saffron souffle. Alors, tu as du en faire cuire combien avant de capter l’instant parfait? 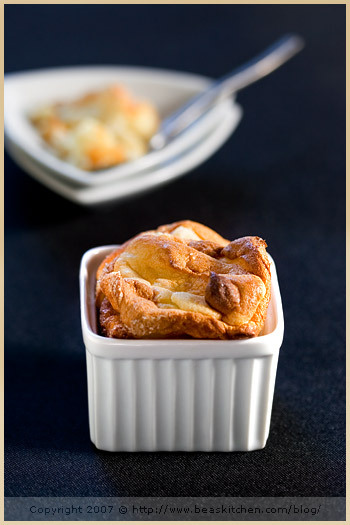 wonderful & appetizing your soufflés! Hi Bea, these look so beautiful! Thank you for including both a sweet and savoury recipe! Thank you again so much for your comments. Merci de vos commentaires, encore une fois! So lovely! I think the fact that they fall makes them all the more special. 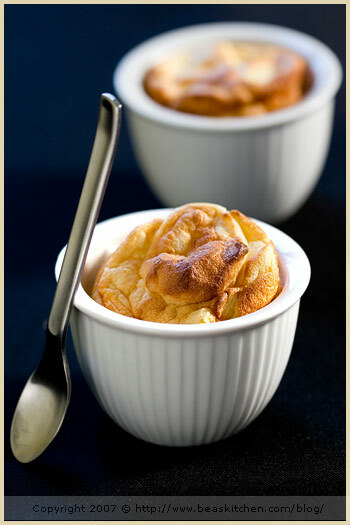 A thing of beauty, all too temporary, so you really appreciate a souffle–and the person who makes them!!!! Those are beautiful souffles… very impressive! Lilo, les moules, je les ai achetes en ligne, sur un site ici aux US. I can’t choose between the two. They both sound fantastic. Great to have you join HHDD this month Bea. I have officially fallen in love with Bea and her kitchen. I love your soufflés and I also adore the metal heart shaped handled ramekins… where did you get them, they’re fabulous? J, thanks. The molds were bought at jbprince.com. Good luck! yours looks very lovely with briliant photography. i love it!! Bonsoir Béa, J’aime beaucoup ce que tu nous montres mais peux tu me dire ce qu’est la crème de tartare et où on la trouve? I love the little dishes that you used! 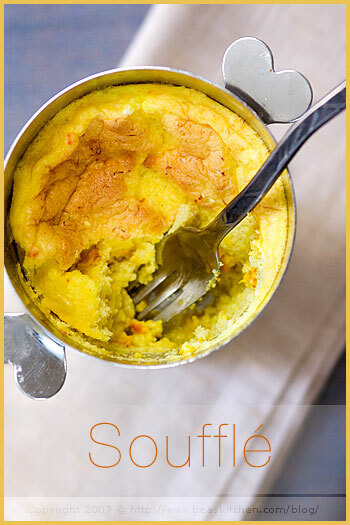 I’m going to try the crab saffron souffle when I return from vacation. Can’t wait!